Welcome! We are so glad you are visiting our website today, and hope it will give newcomers a glimpse into our church community, as well as provide members and friends with current news and information. The Melrose Highlands Congregational Church was founded in 1875 in the loft of a barn when some in the community felt a Sunday School needed to be started in the Highlands section of Melrose. We moved out of the barn a short time thereafter and have been expanding our ministry ever since. We are a member of the United Church of Christ. Through worship on Sunday mornings, Labyrinth walks once a month, service through Bread of Life and Habitat for Humanity, and sponsoring a monthly dance for middle school youth, we seek to extend God’s love into the world. We hope you will take another step and inquire about all the ways in which the Highlands Church can be a source of inspiration in your life and an outlet of service in Christ’s name. 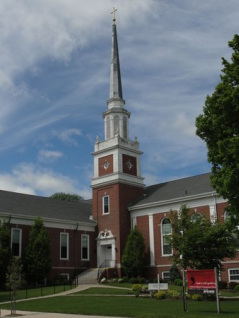 The Melrose Highlands Congregational Church, UCC opens its doors to you. We are located at 355 Franklin Street in Melrose, MA.